Dr. Curtis Coley graduated the medical school from the Penn State College of Medicine and completed his residency program at the Mount Sinai Beth Israel. A fellowship in Pulmonary Disease and Critical Care Medicine at the University of Michigan Hospitals and Health Centers followed soon after that. Dr. Coley is specialized in pulmonology and board certified in internal and critical care medicine and also in pulmonary disease. 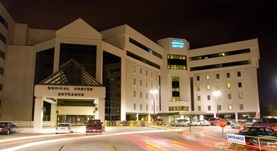 He has been in practice for more than 11 years and is affiliated with Southeast Alabama Medical Center. During his career, he has published one writing of medical interest in partnership with other doctors. Dr. Curtis Coley has contributed to 1 publications. Fibrin ring granuloma in chronic hepatitis C: virus-related vasculitis and/or immune complex disease? Glazer, E., Ejaz, A., Coley, C.J., Bednarek, K., Theise, N.D.; Semin Liver Dis. 2007 May.